PS4 Pro | 4K games, faster frame rates & enhanced performance from our best gaming console. Winner of the 2018 iF gold award for product design. Give your gaming a boost with the most powerful PlayStation ever made. Play the latest blockbuster games and PlayStation exclusives in stunning 4K and stream your favourite entertainment with incredible visual detail from 4K compatible services. Increase your immersion in the fastest, most explosive PS4 games with boosted frame rates in a range of PS4 Pro enhanced games, made possible by the extra power of PS4 Pro. 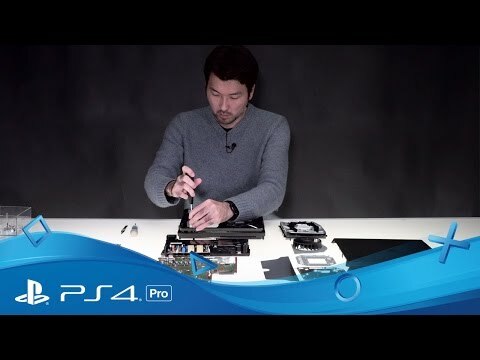 PS4 Pro packs in twice the GPU power of the standard PS4 – letting you experience incredible image clarity, smoother gameplay and shorter load times in PS4 Pro enhanced games**. Enjoy more vibrant, lifelike colours and details in every part of your gaming experience when you play on an HDR-compatible TV. Many of the biggest and best PS4 games get an additional boost from PS4 Pro enhancements that fine-tune the game’s performance. From the stunning Manhattan skyline of Marvel’s Spider-Man and the towering Norse mountains of God of War, to the vast plains of Red Dead Redemption 2 and the intense battlegrounds of Call of Duty: Black Ops 4, you’ll feel the power of your games unleashed wherever you see the Enhanced for PS4 Pro badge**. Play the latest games in amazing 4K* clarity; skin tones become warmer, materials take on realistic textures and environments come alive like never before. to 2160p, to approach 4K* clarity. With an HDR TV, compatible PS4 games display a range of colours closer to the full spectrum that the human eye can see, delivering unbelievable vibrancy and lifelike details. Close-up details and textures like dirt and rust become more intricate with PS4 Pro - while darker, cleaner shadows at greater distances give games an enhanced sense of depth. Action becomes faster, smoother and more explosive with support for faster and more stable frame rates**. Frame rates are boosted and locked in place for some games on PS4 Pro. PS4 Pro targets faster frame rates for select PS4 games. Stream the biggest movies, hottest TV shows and latest videos in 4K resolution* from Netflix, YouTube and a host of entertainment apps with auto-upscaling for the sharpest picture possible. Get a super-charged gaming experience from your PS4 Pro enhanced games – even when playing on a non-4K TV. Supersampling mode takes your game’s highest resolution and uses that extra visual information in certain games to deliver smoother curves, sharper edges and more refined details when downscaling to an HD TV. Cleaner lines and sharper corners bring enhanced realism to games. Visual in-game elements display incredibly lifelike movement and detail. Horizons expand into the distance with improved focus and clarity on distant objects. Close-up details take on added intricacy to give an enhanced sense of realism to games. Darker, deeper, cleaner shadows give an incredible sense of depth to far-off vistas. Delivery of features varies according to game. Pair the visual power of the PS4 Pro with cutting-edge picture technologies of the Sony BRAVIA 4K HDR TV range and see your games explode into life with vivid colour and detail. Buy your super-charged PS4 Pro now and take your play to the next level with 4K gaming and entertainment, faster frame rates and enhanced graphics. Screen images simulated. HDR capable TV, PS4 Pro games console and games title required. *Games and entertainment streaming services can output up to 2160p; PS4 Pro upscales lower resolutions to 2160p. HDR not supported by all games and entertainment streaming services. 4K/HDR TV required for 4K and HDR.​**HDR and faster frame rates not supported by all games and video content. **Select games may have enhanced visuals, frame rate, or increases in resolution. 'PS4 Pro Enhanced' features vary by game. 4K TV Required for 4K visuals. 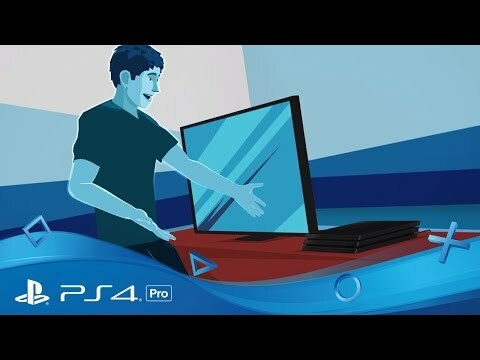 PS4 Pro plays all PS4™ format games.